Registration price of $249 is currently available only to ATD members from now until April 12, 2019. Registration will be open to non-members beginning April 12, 2019 until May 1, 2019 for a cost of $279. Do you want to become a more valuable asset to your organization? 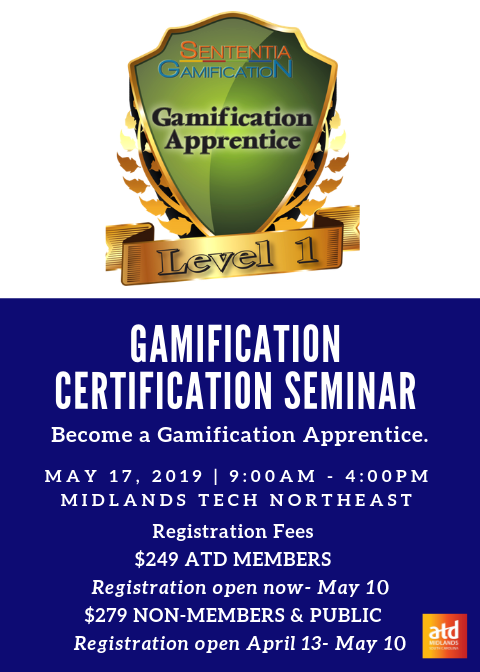 Prove your high level of knowledge and skill development by spending the day receiving a Level 1 Gamification Certification through Sententia Gamification! Participants will receive a Sententia Level 1 Apprentice Certificate! that you can earn recertification credits with ATD, HRCI, and SHRM. Become a better, higher-rated, and considerably more effective trainer, instructional designer or human resource professional! This program is like no conference or workshop you’ve attended. The Sententia Gamification Certification is a complete immersion experience designed to leave you creatively inspired and technically masterful. Be prepared to come and PLAY for the entire day to dramatically improve your learning and development results and significantly increase your credibility and influence and a professional. A Special registration is currently open to ATD Members until April 12, 2019. On April 13 Registration will be available to non-members and the public until May 1, 2019 for $279. Seating is very limited, so REGISTER TODAY! Interpret how key concepts found in behavioral psychology and game design can increase learning and engagement. Experience a five-part process for gamifying a learning program. 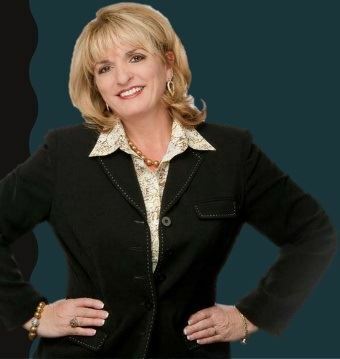 Featured on the cover of Bloomberg Businessweek, Monica works with individuals and organizations who want to learn how to think differently to achieve uncommon results. A gamification speaker and designer, Monica was rated #1 among the “Gamification Gurus Power 100” by RISE in 2015 and 2016, and in 2016 was also recognized as a Top 3 Finalist in the “Gamification Guru of the Year Award” by the World Gamification Congress held in Barcelona, Spain. Monica is the Founder and CEO of the Sententia Gamification Consortium and the author of the book Totally Awesome Training Activity Guide: Put Gamification to Work for You. Monica is hired for her skill as a gamification speaker and is considered at the top of her field in gamification design for corporate learning. Registration, breakfast and networking will be held from 8:30 a.m.- 9:00 a.m.